The cause for the following contribution supplied the rumor, Lex shortly before its death together with Johnny Weissmuller „a Tarzanland “to styles „of the Disneylands “to Hollywood to construct wanted. That is actually correct. That Lex and Johnny at elevated age intended however to jump in the Lendenschurz from tree to tree would be the wrong conception. 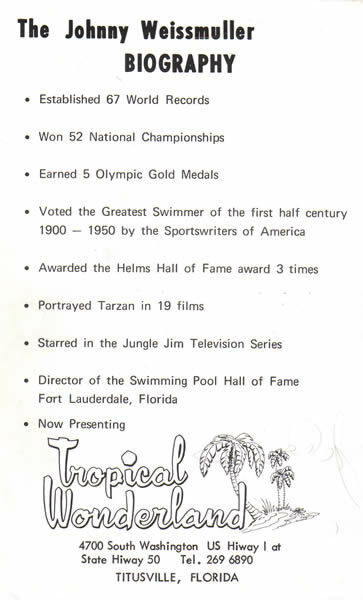 Only after Lex' death was actually created the park, in Titusville/Florida, where Weissmuller had a dwelling together with his Mrs. Maria also. The necessary money for the building of the park did not bring in however protagonist Weissmuller. 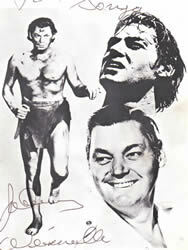 This had long used up the Tarzan percentages of profits. Was financed the park of some polished businessmen, who promised themselves with after like before the prominent names Weissmuller and Barker a success-pregnant business. A component of the deal was also the dwelling Weissmullers financed by the businessmen in the most beautiful accomodation Titusvilles. When I traveled 1978 after Titusville, Johnny straight had moved and its dwelling stood to the sale. 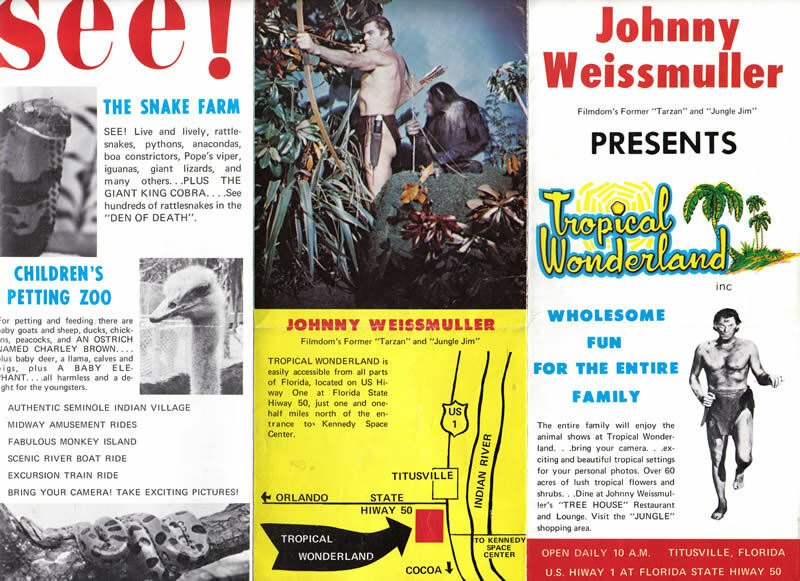 The park, which carried the name „Johnny Weissmuller's Tropical Wonderland “, had closed and saw completely verwildert out. The apes, which one had held there, were all escape and their child children cavort up to the today's day in the area. What had happened? A businessman had Weissmuller its rights at the park for one (!) 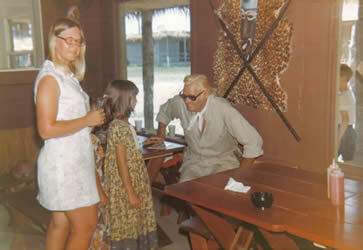 Dollar unbuttoned, when Johnny, a heavy drunkard, was drunk straight. 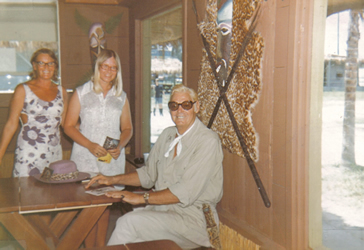 Without Johnny, which turned to anhin daily its rounds in the park, which visitor welcomed and distributed autographs, lost the park at attraction. It is im Übrigen probable that also Lex Barker would assigned have gotten a similarly public-effective job as Mitanleger of the park, if he had still lived. 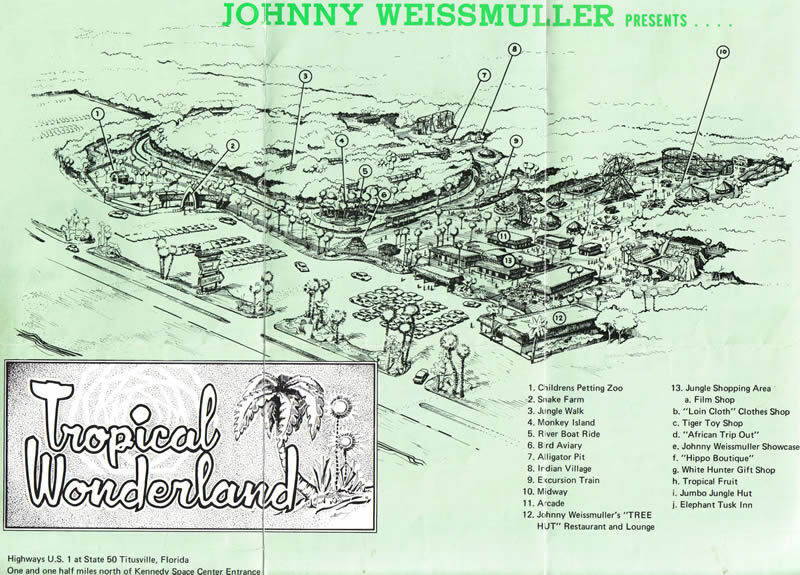 Weissmuller presented itself its guests in the park in each case in a tropical uniform, which seemed certainly more authentically than a bare Lendenschurz. 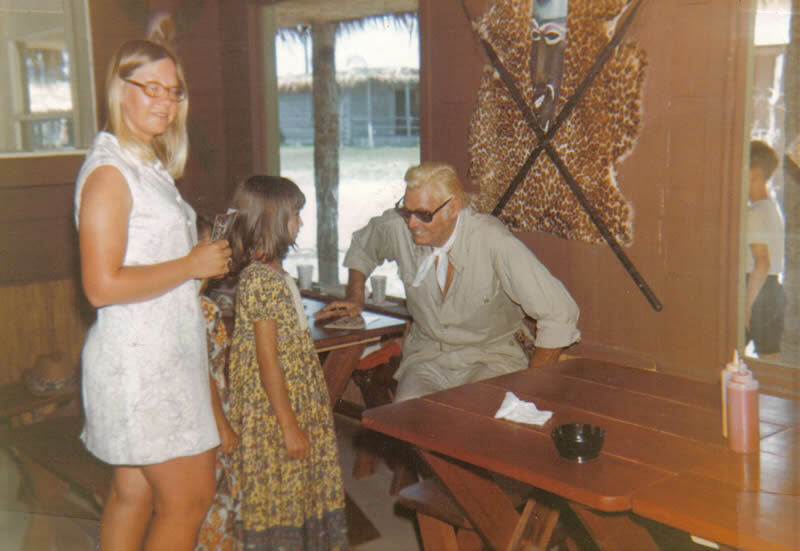 The following photographs show my two aunts with a park visit at the side of a blond or better blondierten Johnny Weissmuller in the early 70's. My aunt Sonja, in the white dress, holds the park leader in the hand, whom I have for you for illustration likewise in-scanned. When I was 1978 in Titusville and regarded me behind a fence the run down park area, a man came to me. He wanted to know whether perhaps I am interested in the park and would like him for an attractive offer to buy. I believe, he was very much disappointed that I said not.